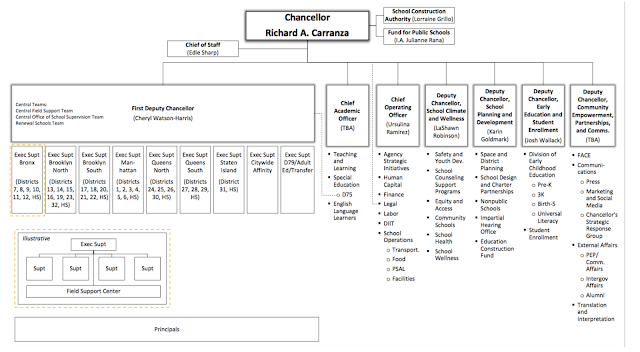 Buried in the news of Janus yesterday, the new chancellor, Richard Carranza, announced his new organizational structure of the NYC Department of Education. Rumors were flying that the new chancellor might see all of the waste that is down at Tweed and do a bit of house cleaning. For those of us in schools, the hope was that fewer people at Tweed would mean fewer monies would be spent in salaries and that, perhaps, some of those resources would bleed down to the school level. The announcement dashed those hopes quicker than Alito's decision in Janus. Far from creating a structure that reduces the bloat over at Tweed, the reorganization created a brand new, very thick, layer of bureaucracy. A new role -First Deputy Chancellor- covers all school supervision related activities. This includes the supervision of a total of 9 other brand new positions -the "Executive Superintendent". These two new positions are poised to be new faceless faces from far away offices who will be eating up the roughly $27 B annual budget of the NYCDOE. The new structure places the DOE on a more politically adept footing, better able to answer the city-wide challenges of the time. School space and charter schools will fall under one Deputy Chancellor. PEP and public relations will both fall under another. And ELL and SWD fall under yet another. Tweed re-orgs have become like rugs in the Oval Office. Each new boss gets to pick his or her own and when it's picked, that's "the look" for the next few years. But this new re-org has all the looks at feels of an entity that will not alienate its current employees and can navigate the politics of the time. What's missing when those are the priorities? I completely agree. It appers the new Chancellor is rearranging the chairs on the Titanic and adding nine new Captains to guide the sinking ship. The bloated Central Bureaucracy becomes more so with a 2 million dollar additional layer of Bureaucracy. I think I will bring a law suit ala Janus. My free speech is being violated by having the DOE espouse policies I do not agree with. So why should I pay taxes to support them?